My ridiculously busy schedule has left me little time to experiment and create new makeup looks on a daily basis. In the spirit of brevity, I have been sporting the same look for the past three weeks straight. So for this long, overdue post I will give detailed descriptions on the brushes used, application of color and overall thoughts on some new products and techniques. I hope you find this helpful. Sonia Kashuk #17 Medium Multipurpose Powder Brush and Artis Oval 7. These eye brushes have served me well for the past few weeks. For brow color application I have truly been enjoying Billy B #12 to pat color in the front portion of the eyebrow. Utilizing a fluffier brush creates more of a natural look as opposed to a harsh angular shape. I have a particular affinity for Giorgio Armani Eye and Brow Maestro in 2 Wenge Wood (reviewed here), but any pomade of your choice will suffice. 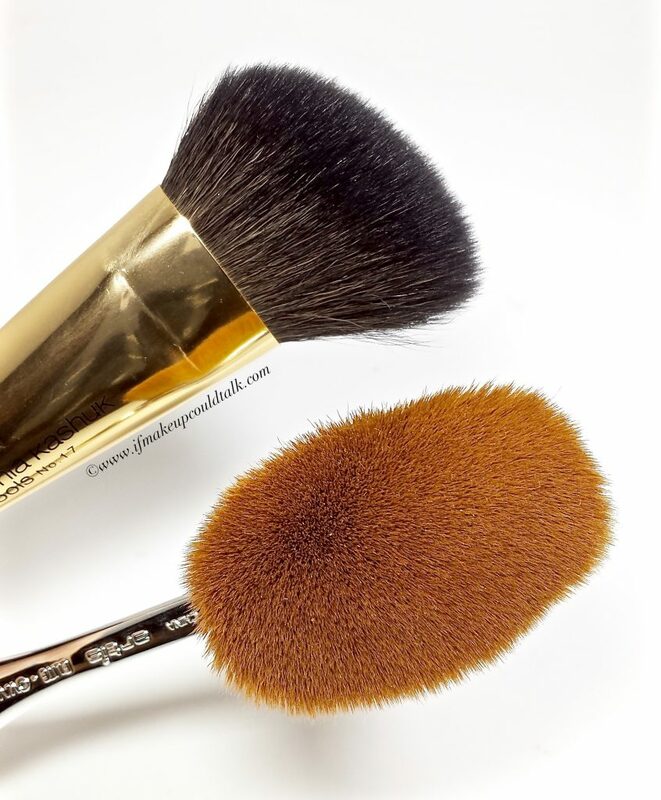 Wayne Goss #21 is one of the most versatile brushes I have ever purchased. The wide, stiff, shortened hairs can be expertly manipulated to create sophisticated shapes or extreme looks. On my fuller brows, WG21 is brilliant for filling in gaps and gently outlining the upper and lower portion of the brows. The design also lends itself as an excellent angled eyeliner brush. If you are keen on using powder as eyeliner, this brush holds color securely and deposits a saturated line on the skin instantly. 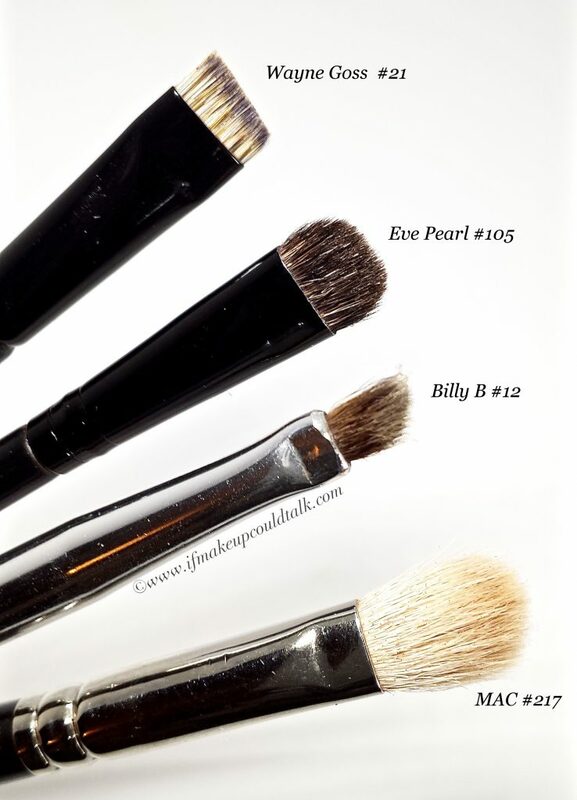 Eve Pearl #105 is one of my favorite blending brushes. Since my large mobile lid requires specific color stratagem, this brush is able to deposit colors accurately and fuse colors seamlessly. When blending out color along the lash line, the dense, slightly stiff fibers do not create drag on the skin. Anyone ranging from the novice realm to professionals, should own the MAC 217. The dupes for this brush are far and wide, but I wholeheartedly favor the original. The design of the 217 is wonderful for all over color application, crease work, and outer “v” application. Sonia Kashuk #17 was a complete impulse purchase–one which I’m most fond of. The soft natural goat hairs possess the right density, shape and length for bronzer, blush and highlighter application. This brush is even fantastic for finishing powders and to kick of excess powder (aka: bake) under the eye area. Artis Oval 7 (reviewed here) is a complete must-have if you are into flawless foundation application. Recent outstanding customer service has deepened my devotion for this brand. Should an issue arise over any of your brushes, Artis customer service promptly addresses and works diligently to resolve the situation. Start by priming lids with your favorite primer. 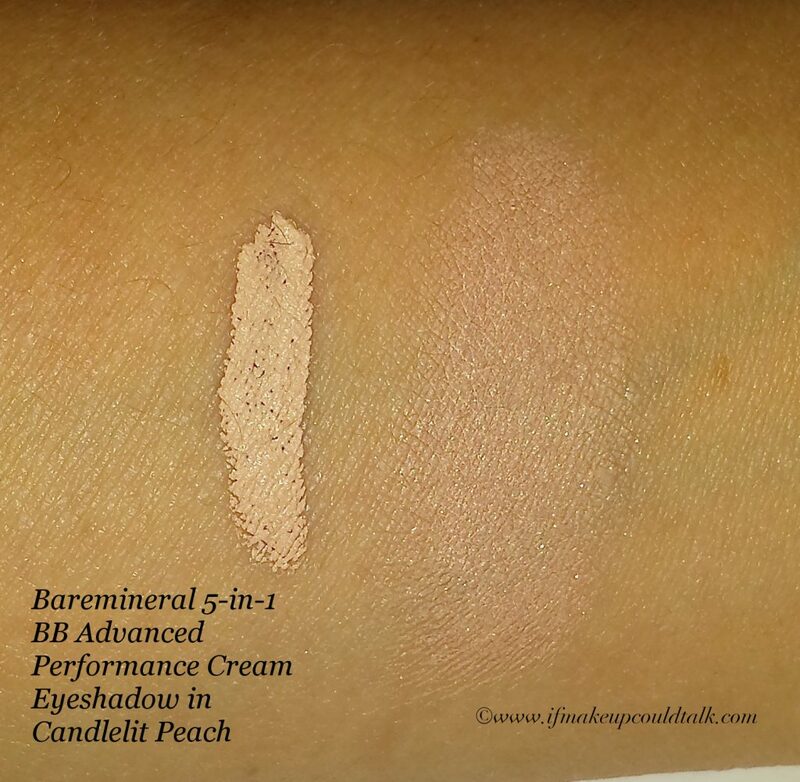 I use NYX primer and a bit of bareMinerals 5-in-1 Candlelit Peach to cancel out any discoloration. This particular color has delicate shimmers throughout, the effect is illuminating rather than offensive. Armani Navy, MAC Uninterrupted, the balm Caught in the Act Courtney, ABH Sienna, and MUFE M510. MUFE #510 and MAC Uninterrupted. 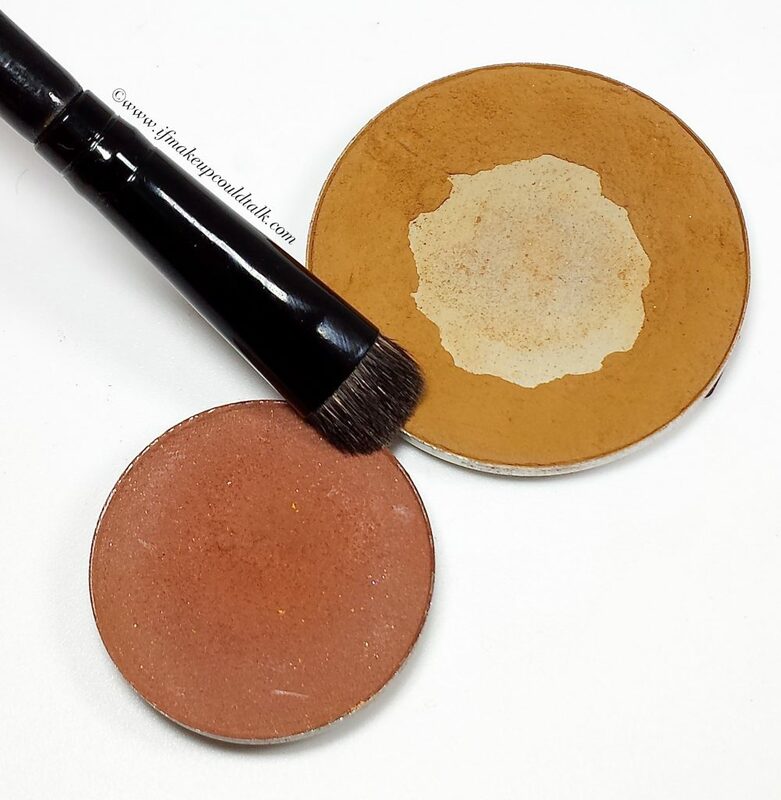 Proceed by adding a flesh color eyeshadow (MUFE M510) over the primer. 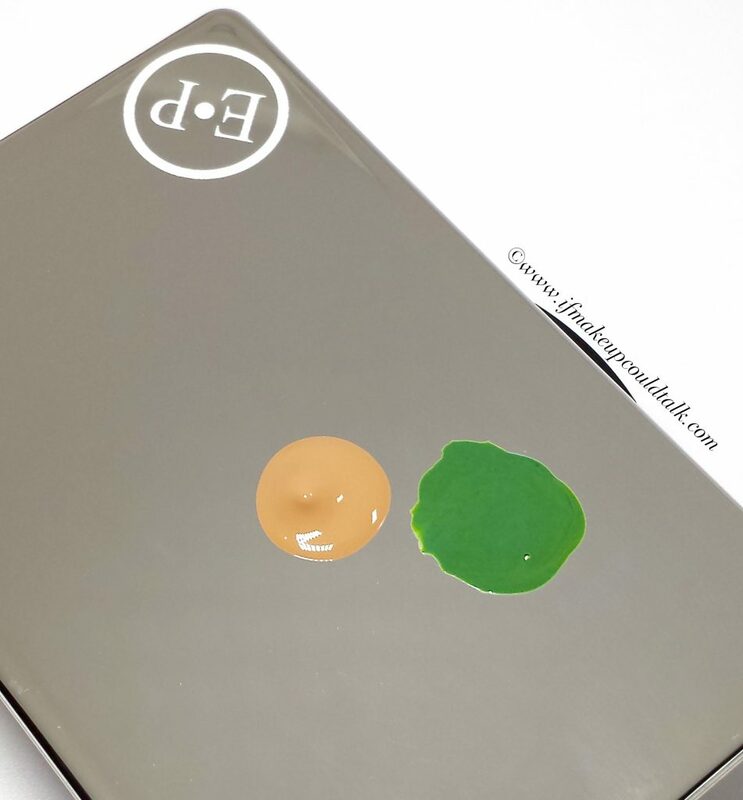 This step will ensure the primer is set and other eyeshadows will glide on the skin easily. Take the MAC 217 and add MAC Uninterrupted (or any other warm shadow) to define the crease area. ABH Sienna and MAC Uninterrupted. Using a smaller brush (Eve Pearl 105) take a combination of MAC Uninterrupted and ABH Sienna to the outer “v” area and under the lash line. theBalm Caught in the Act Courtney. Using Wayne Goss #21 take a rich chocolate brown color and run it along the lash line in a wedge shape, extending the other portion into a winged line. Proceed to blend the line upwards, with Eve Pearl #105 brush, until the color fades into the flesh base and a gradient effect is achieved. Add more color as you see fit until you reach your desired intensity. Step 7: Tom Ford Eye Defining Pen. Next, line the upper lash line with any black liquid liner of your choice. 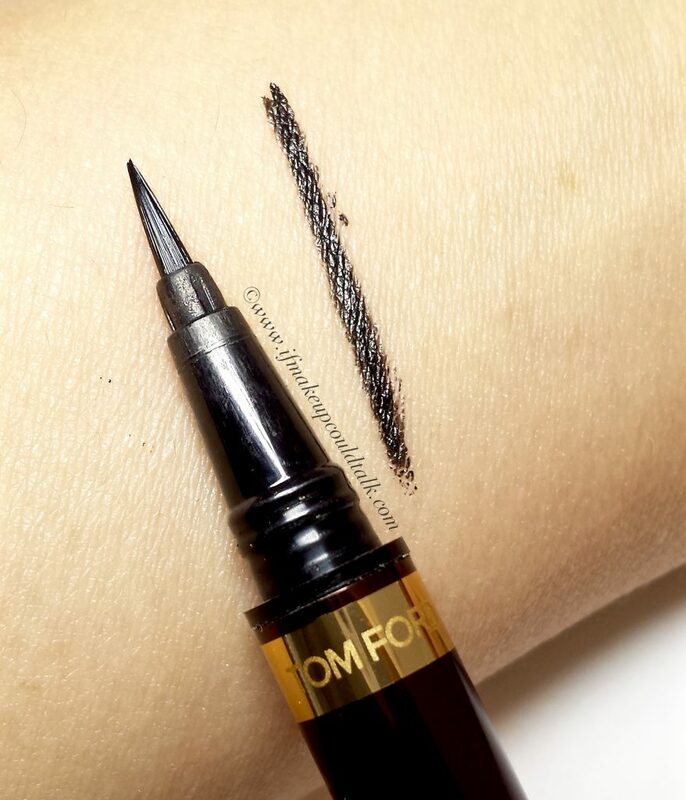 Tom Ford Eye Defining Pen is so user friendly, even the most inexperienced makeup novice will achieve a perfect line. This step is solely intended as a guide line for the navy liner. 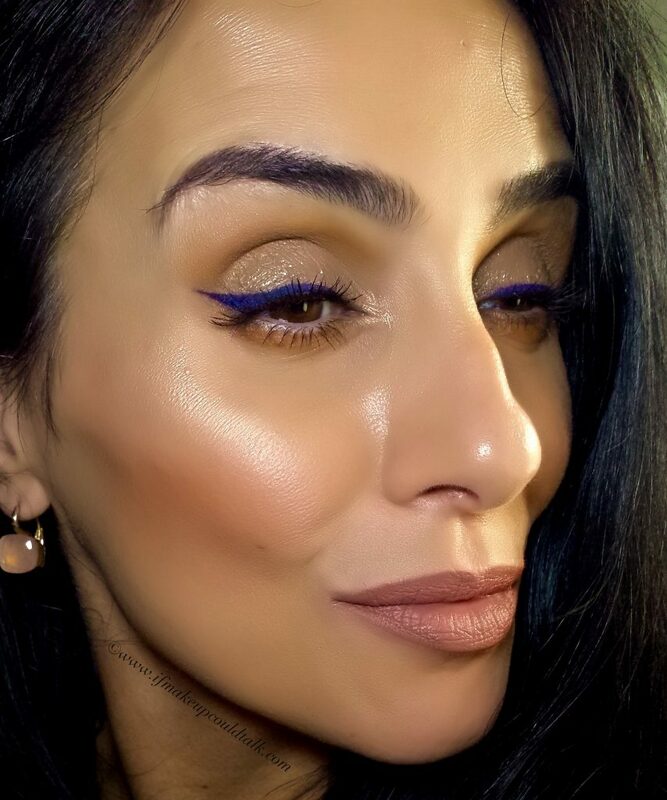 Using a small brush (Billy B #12) gradually pat Armani Navy (the very best navy color IMHO) on and over the outer half of your winged liner. 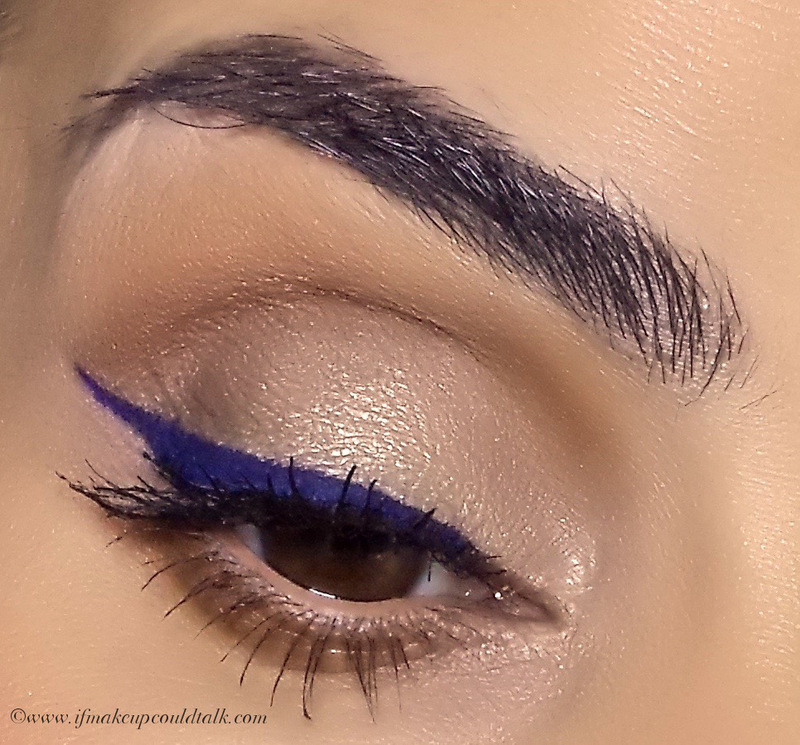 This rich navy will help create dimension and transition the upcoming navy liquid liner. Wayne Goss #21 with Too Faced Melted Matte Lipstick in Who’s Zooming Who. 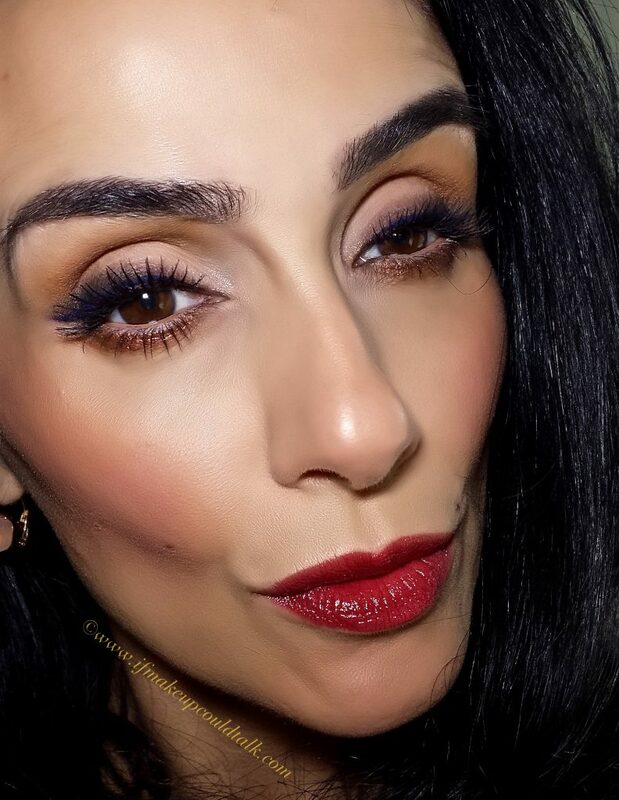 Now for the star of the show, take Too Faced Melted Matte Lipstick in Who’s Zooming Who on Wayne Goss #21 and PAT the color over the black liner. Patting motions allow optimal control and even color distribution. The stiff fibers, although not the plushest, will ensure color is placed exactly where one desires. Step 10: MAC Coil on the lower lash line. As an added pop of copper sparkle, pickup a bit of MAC Coil on a sponge tip applicator and pat it on the center of the lower lash line, over the existing eyeshadow. 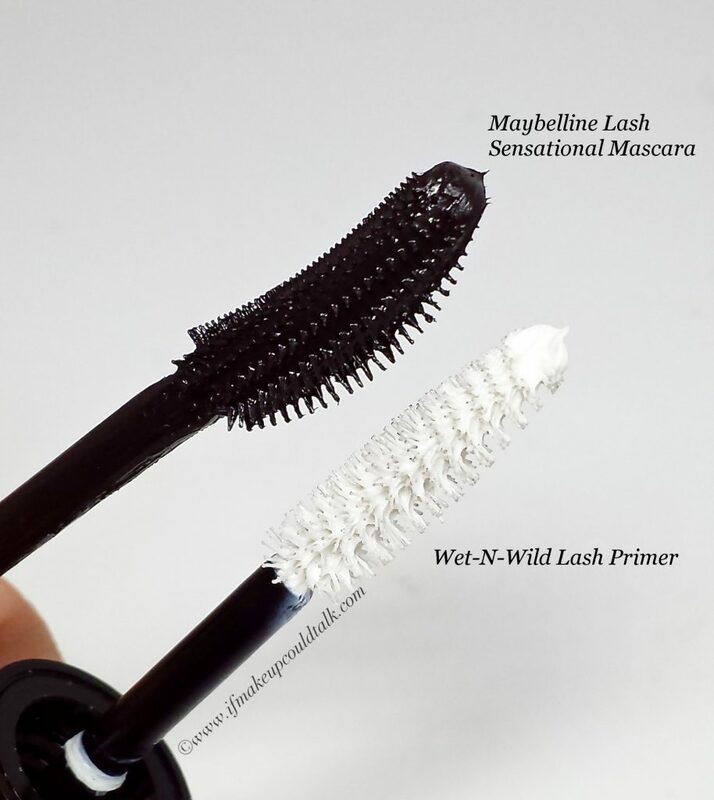 Step 11: Wet-n-Wild Lash Primer with Maybelline Lash Sensational. Next, apply Wet-n-Wild Lash Primer to the lashes. Let this set for a good 15 seconds before applying mascara. This primer is not only incredibly affordable, but is one of my favorite lash primers. To boot, mascara adheres the entire day and removal is so much easier at the end of the day. 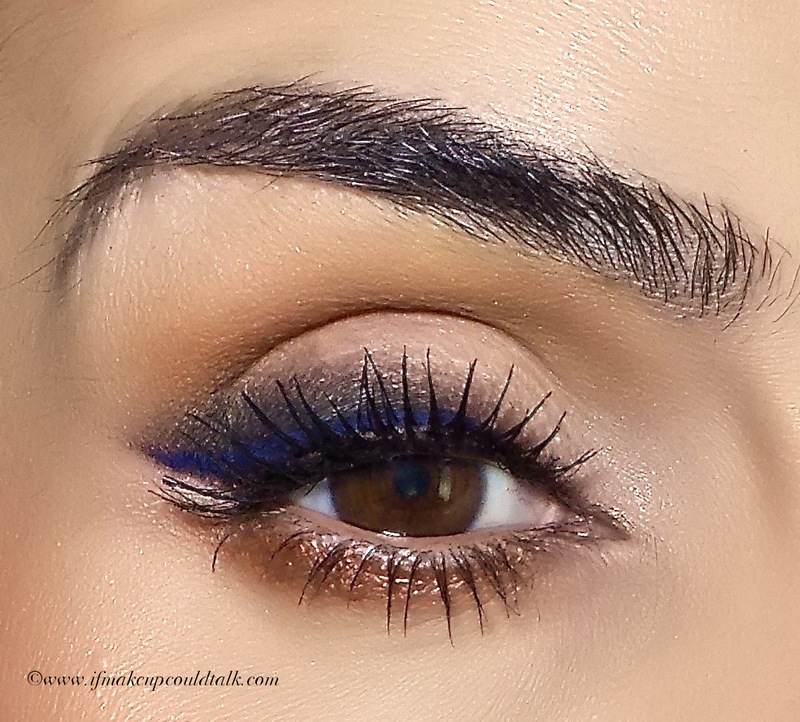 As usual my mascara of choice is Maybelline Lash Sensational (reviewed here). If you don’t have it–Get It!! 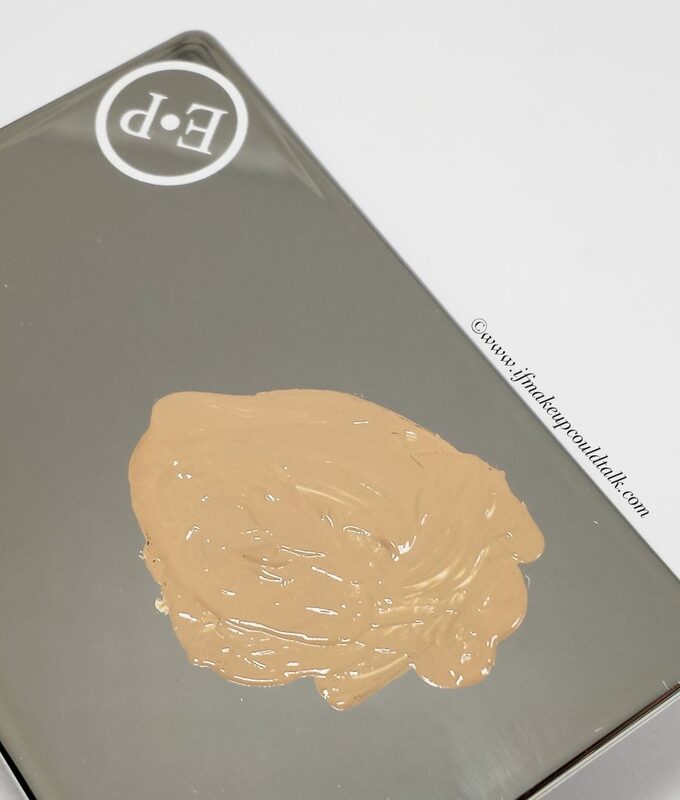 As a finishing touch, I added Bobbi Brown Taupe (reviewed here) on the waterline. Kett Hydro Color Theory in Yellow and Blue with Marc Jacobs Re(Marc)able Foundation. Kett Hydro Color Theroy mixed with Marc Jacobs Re(Marc)able Foundation. Taking my Eve Pearl Pro Mixing Palette, add Kett Hydro Color Theroy with your foundation of choice to obtain the right undertone. The yellow and blue colors meld to produce a green tinge that seems to accommodate the olive undertones inherent in my skin. Although technically an airbrush product, these drops work beautifully with my Marc Jacobs Re(marc)able Foundation in 35 Beige Taupe. 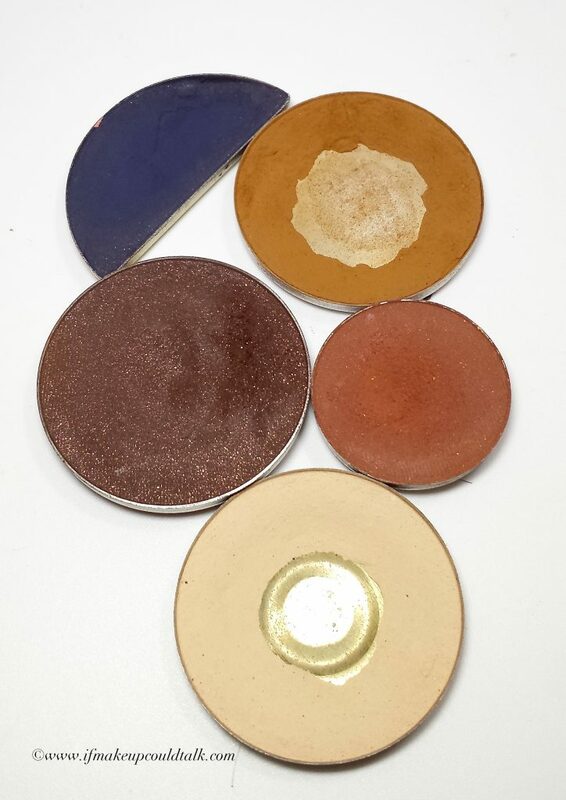 Makeup For Ever also produce Chromatic Drops color adjusters, but the yellow and blue colors are always sold-out. I’m so happy to have found Kett’s paraben-free, lightweight version. If you are unhappy with the undertone of your foundation, these drops (5 colors in all) will instantly calibrate any formula to your unique coloring. RCMA No-Color Powder, Cinema Secrets Ultralucent Setting Powder and Beautyblender mini. I’m not one to follow trends so easily, but I must admit the “baking” sensation that is sweeping Youtube has some validity. 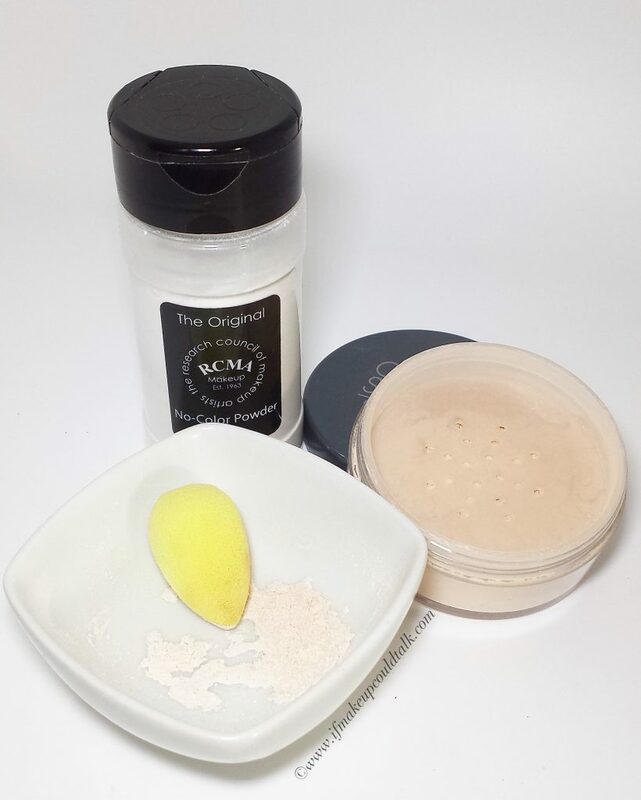 For my olive complexion, I find a mixture of RCMA No-Color Powder and Cinema Secrets Setting Powder in Beige work well. The “No-color” claim is amusing to me, considering the amount of white powder used during baking will undoubtedly leave a slight white cast on the skin. 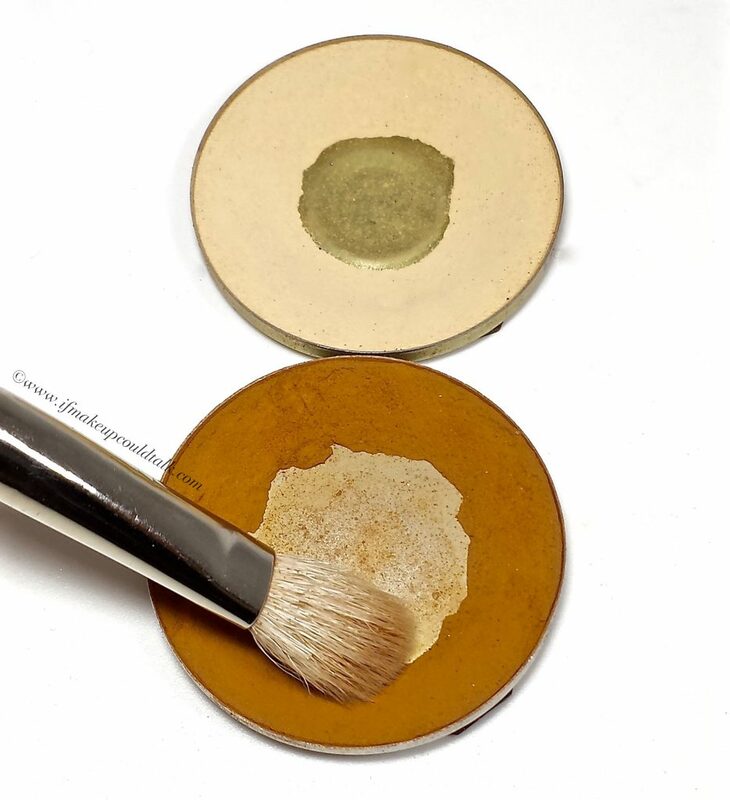 Medium and darker skins are advised to pick RCMA Warm Golden Powder (or any other yellow/warm color) instead. In my case, mixing the two powders grants me the best of both worlds–color (CS) and smoothing properties (RCMA). I simply use my dampened beautyblender mini to pick up powder and apply a generous amount to set the under eye area. Personally, I let the powder “bake” for five minutes before I gently remove it with my brush. The results do not settle into fine lines, even on my slightly mature skin. The under eye area seems to remain flawless the entire day, amidst countless hours in humid pool conditions, during my sons’ swimming and diving sessions. For highlighter I used Illamasqua OMG (reviewed here) and for blush Laura Mercier Lush Nectarine has made a triumphant return in my routine. 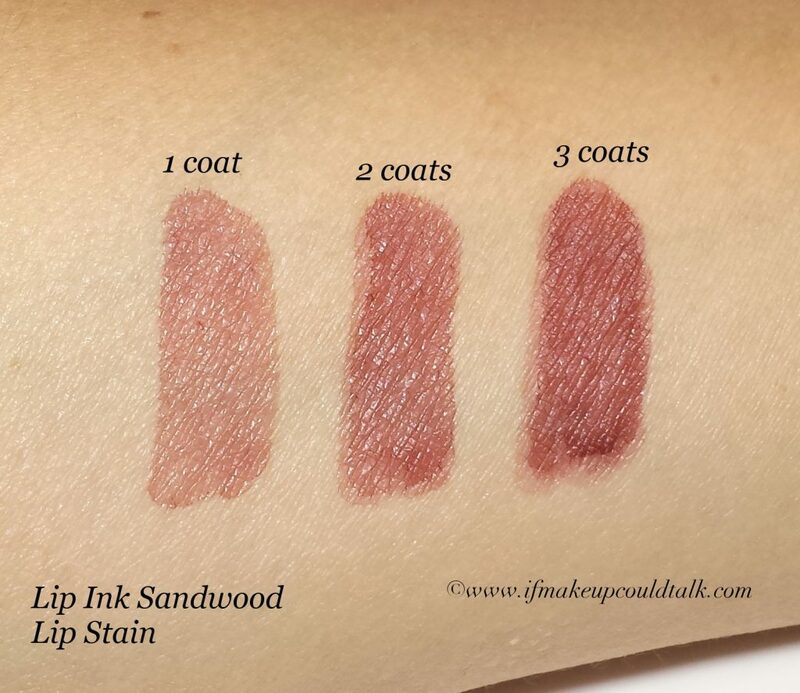 Lip Ink Sandwood Lip Stain. Lastly, I applied one coat of Lip Ink lip Stain in Sandwood to clean, exfoliated lips. These stains have to be the most enduring formulation I have ever tried. However, I don’t particularly care for the gloss in the line, instead I added Chanel Rouge Allure Gloss in Pirate for this look. The company emphatically does not recommend using other cosmetics with their stains, because they may compromise the wear of the stains. In this case, that claim is true. Normally, my Dior Addict Fluid Sticks work well with the Lip Ink stains, but Pirate was so pretty I could not resist. Makeup would tell you, these are a lot of products for daily use. However, considering I despise touching-up my makeup throughout the day (lipstick excluded), I can honestly state this look holds up well from the moment I apply it to the end of the day. Taking that bit of time (45 min) for myself at the start of the day, gives me the confidence and stamina to get through a busy schedule. Like I always preach to my kids, “If you look good, you feel good and you do well.” Who wouldn’t want that? 🙂 Until next time, be well, stay safe and be happy. 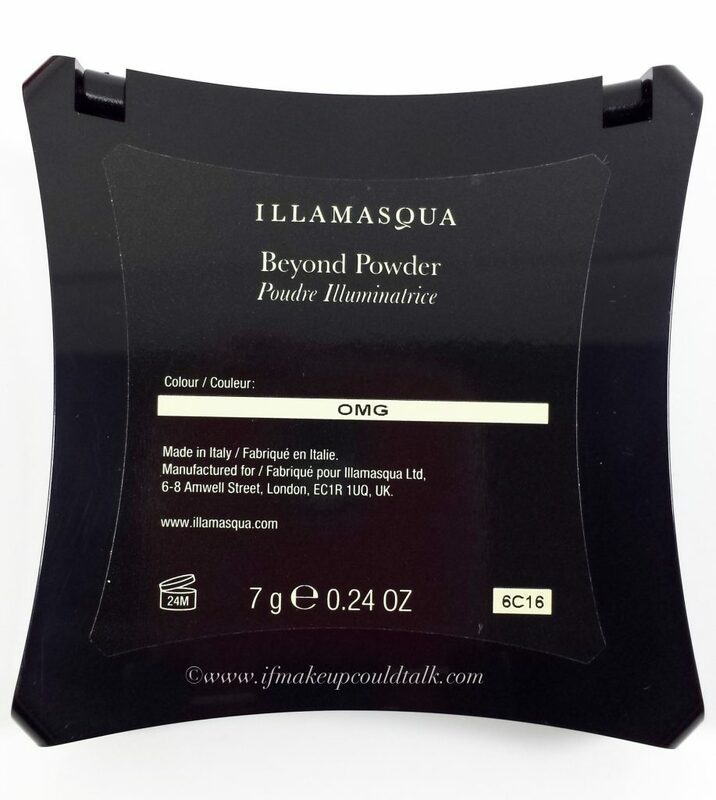 Since my resounding success with Illamasqua Epic Beyond Powder (reviewed here), I have been anxiously awaiting the arrival of Illamasqua OMG Beyond Powder ($45 USD/ 7 g). 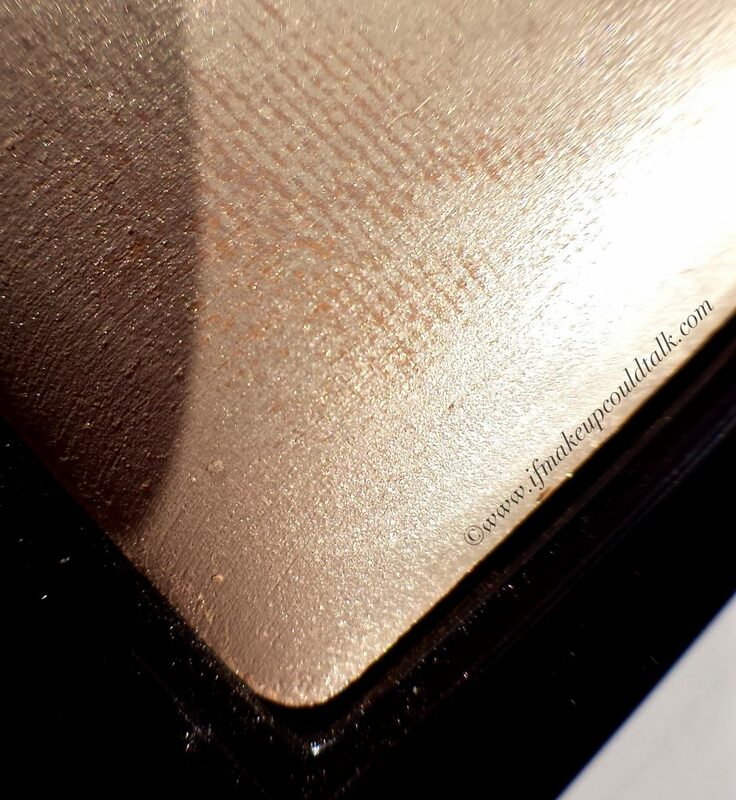 This warm champagne golden highlighter has proven its worth many times over. Do you need this in your life? Like O.M.G….Totally 🙂 I hope you enjoy. 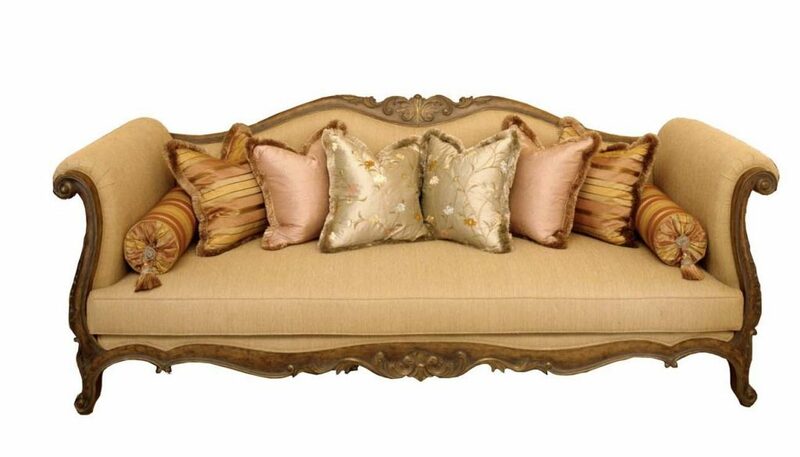 Moroccan inspired sofa (photo courtesy of zinascos.blogspot.com). Before we go on, I would like to take a moment to appreciate the elegant design of the powder itself. Although rather simple in concept, there is something about the silk-like finish, puffy style and rounded edges that resembles something found in Moroccan decor. I can completely envision Illamasqua OMG and Epic Beyond Powders as throw pillows for an elaborate chaise love seat or sofa. As we all know, with higher-end cosmetics the expectation for exquisite packaging and design is high and in this instance, Illamasqua certainly delivered. Illamasqua OMG Beyond Powder in direct sunlight. 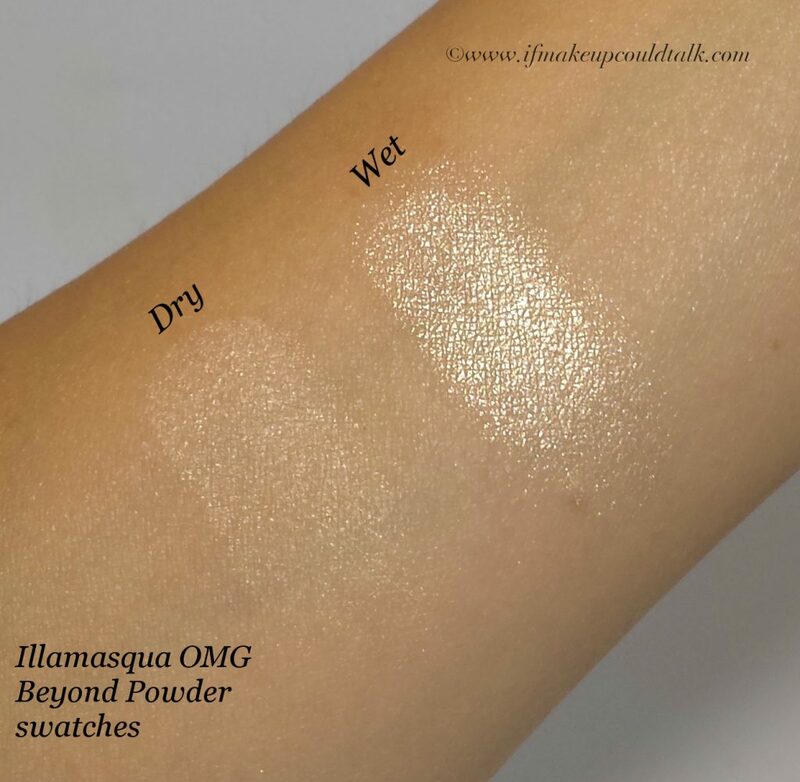 Illamasqua OMG Beyond Powder swatched indoors on sunny day. Wearing Illamasqua OMG Beyond Powder dry and wet swatch. As you can tell, Illamasqua OMG has a lovely subtle warmth running throughout. Depending on the lighting conditions and angle, a gorgeous flush undertone emerges apart from the superficial golden facade. The unique hidden fragments of beige, pink and peach intermix beautifully to fit a variety of complexions. On first impression, the sheer nature of this powder seems to compliment pale to lighter skins. However, when applied with a slightly dampened brush, the strong golden tones dominate and become apparent on medium, olive and deeper skins. When applied with a dry brush, the finish is quite sheer. If you are someone who prefers instant, in your face, blinding highlighting powders, then this offering may not suit your needs. On the other hand, professional women, mature skins and even slightly more conservative young ladies will appreciate the sophisticated depth provided by this powder. Time permitting, a radiant finish can be achieved simply by using a dampened brush. Personally, I like to spray one side of my brush with water to apply an initial layer on the skin. Afterwards, I use the dry side of the brush to buff-out the highlighter, ensuring a seamless application that fuses perfectly with the skin. 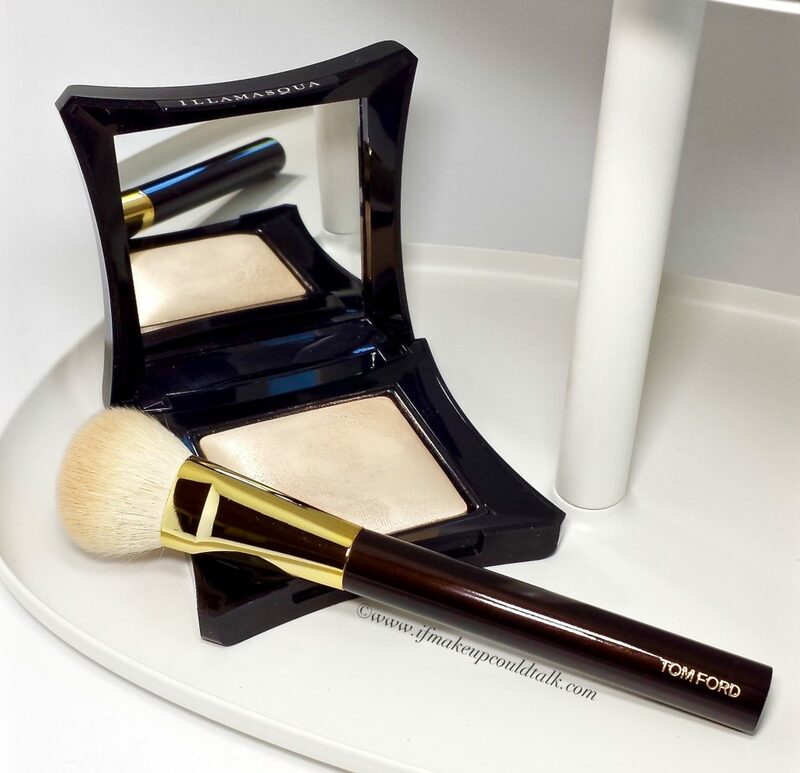 Illamasqua OMG Beyond Powder with Tom Ford Cream Foundation Brush. 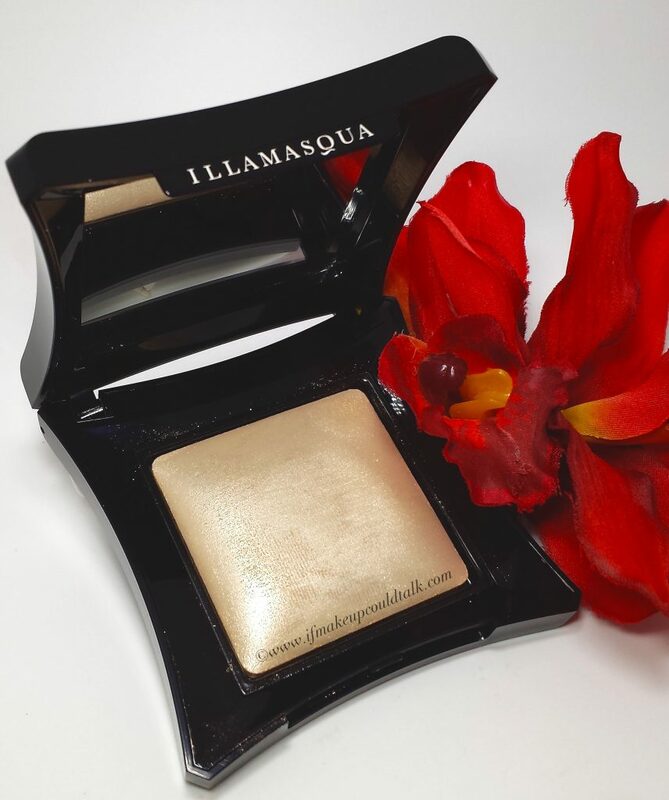 Illamasqua OMG does not contain any shimmer or sparkle. The formula is incredibly smooth and soft and glides on in the same manner. You are left with the most beautiful sheen on the skin. OMG, unlike Epic, applies best with my Tom Ford Cream Foundation Brush. The dense composition of this brush is perfectly suited to pick-up and deposit just the right amount of product. 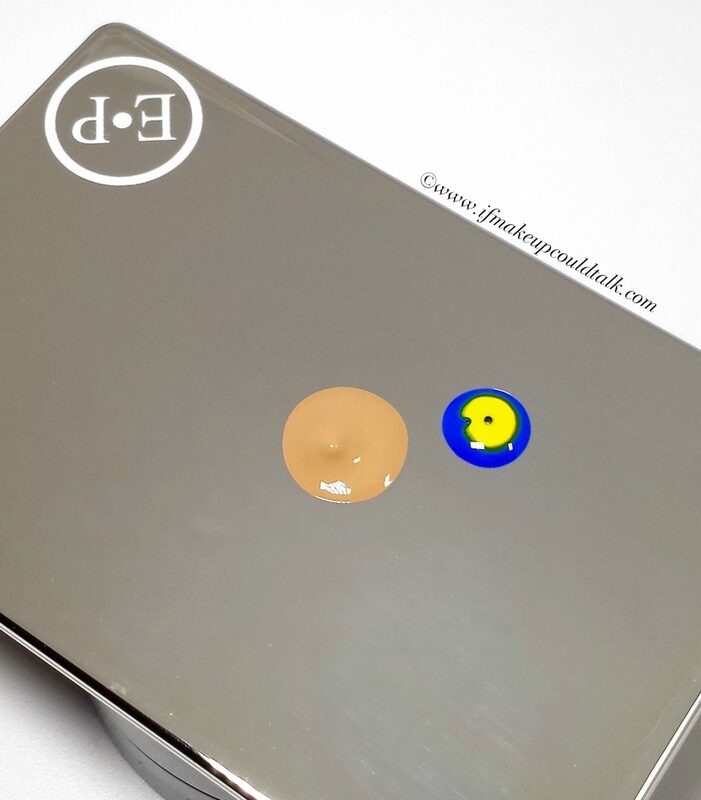 The lack of lightweight shimmer, paired with the finely milled formula may very well be the culprit for this differentiation. In my experience, I found both Beyond Powders respond favorably to natural hair brushes. 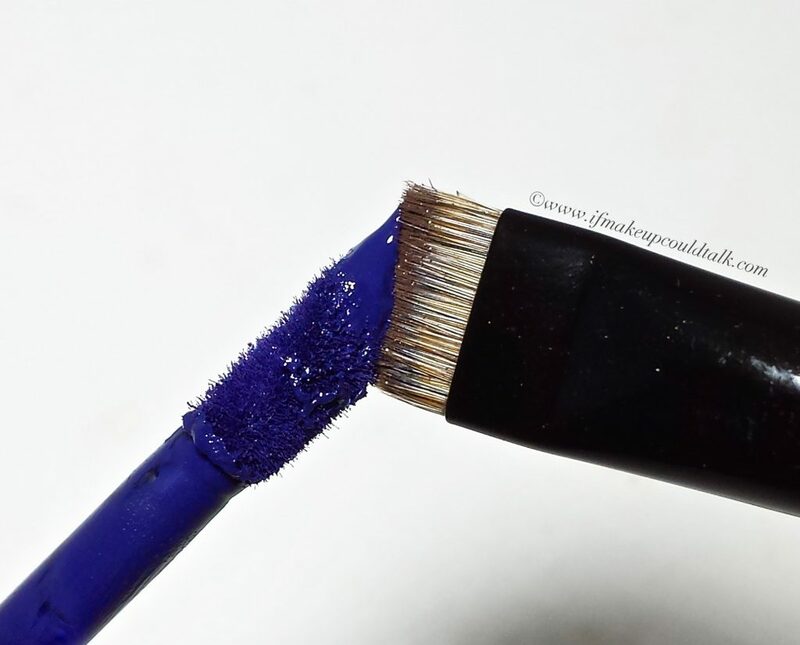 When I tried to use my Artis Brush or MUFE Kabuki Brush, the super dense synthetic fibers were unable to pickup and place a satisfactory amount of product on the skin. Granted, I do not have every synthetic brush on the market and can only make these generalizations based on my experiences. If you are strongly opposed to animal hair brushes, and want to try llamasqua Beyond Powders, try to find a dense synthetic brush with some movement. 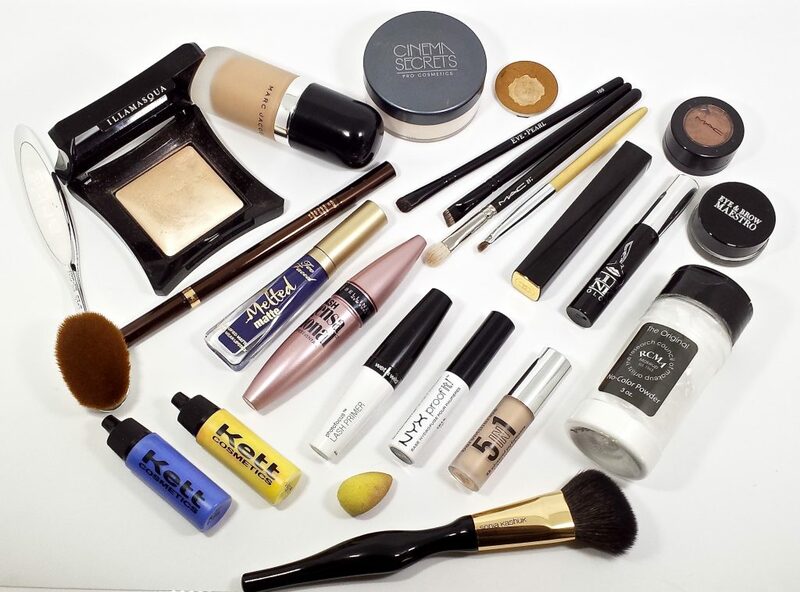 EcoTools, Real Techniques, Illamasqua and Marc Jacobs offer a fair amount of synthetic options for you to explore. Wearing Illamasqua OMG Beyond Powder on the tops of the cheekbones, bridge of the nose and inner corner. For the above photo, Illamasqua OMG Beyond Powder was applied with a dampened brush to the tops of the cheeks, the bridge of the nose and the inner corner of the eye. This photo was taken at 6:30 pm after a ten-hour day out and about. In the spirit of full disclosure, I was mostly in an air-conditioned environment, with sporadic moments in hot and humid weather. Illamasqua OMG Beyond Powder applied on the mobile lid. For the above photo, Illamasqua OMG was applied on the mobile lid, over Bobbi Brown Sand Dune Shadow Stick. The slightly tacky cream shadow locked OMG in place for the entire day without any fading or creasing. 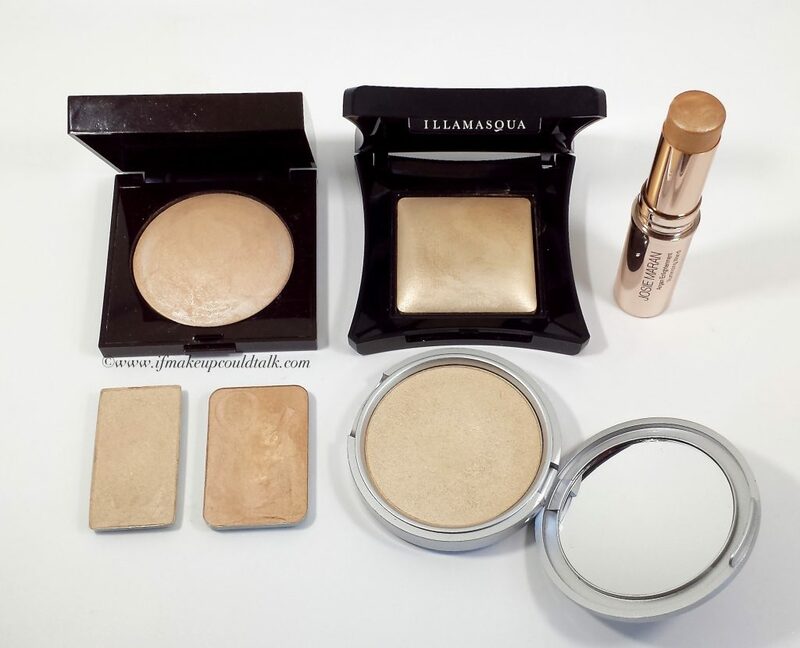 Laura Mercier Highlight-01, Illamasqua OMG Beyond Powder, Josie Maran Enlightenment Wand, Kevyn Aucoin Candlelight, Dior Cosmopolite, theBalm Mary-Lou Manizer. Kevyn Aucoin Candlelight, Dior Cosmopolite, Josie Maran Enlightenment Wand, Illamasqua OMG Beyond Powder, theBalm Mary-Lou Manizer, and Laura Mercier Highlight-01 (photo taken indoors with LED lighting). 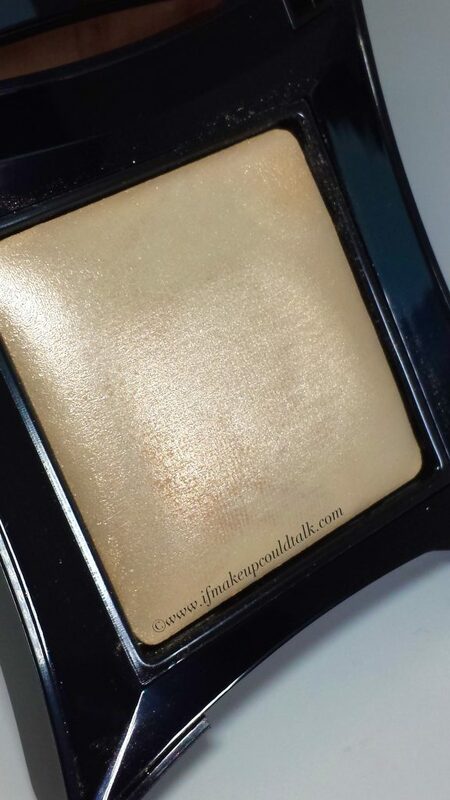 Kevyn Aucoin Candlelight (reviewed here) is a very sheer true champagne highlighter that leans on the neutral spectrum. 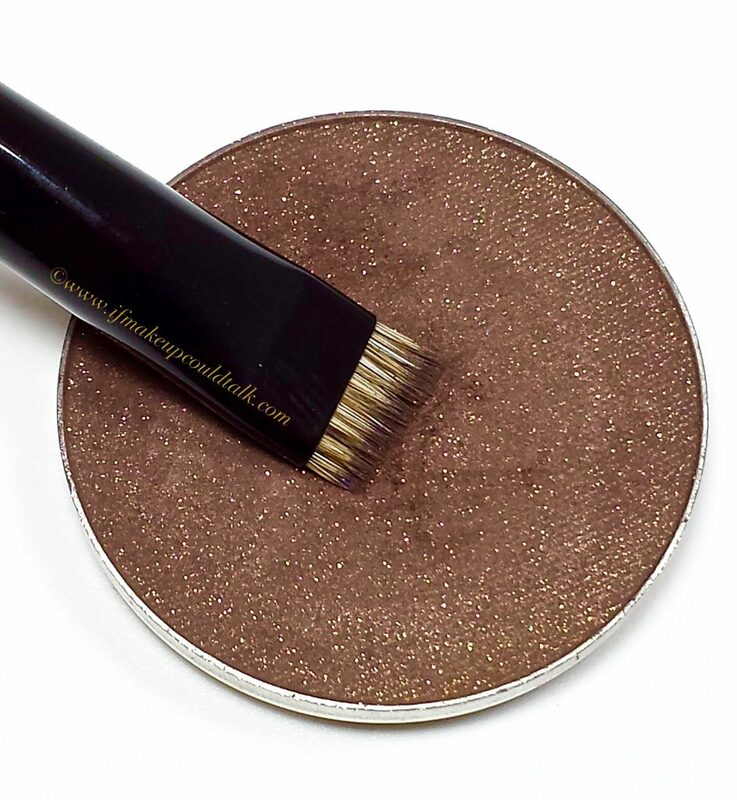 Personally, this shade is used mostly as an eyeshadow rather than a highlighter. Even when used with a dampened brush, the results are not as striking as I prefer. 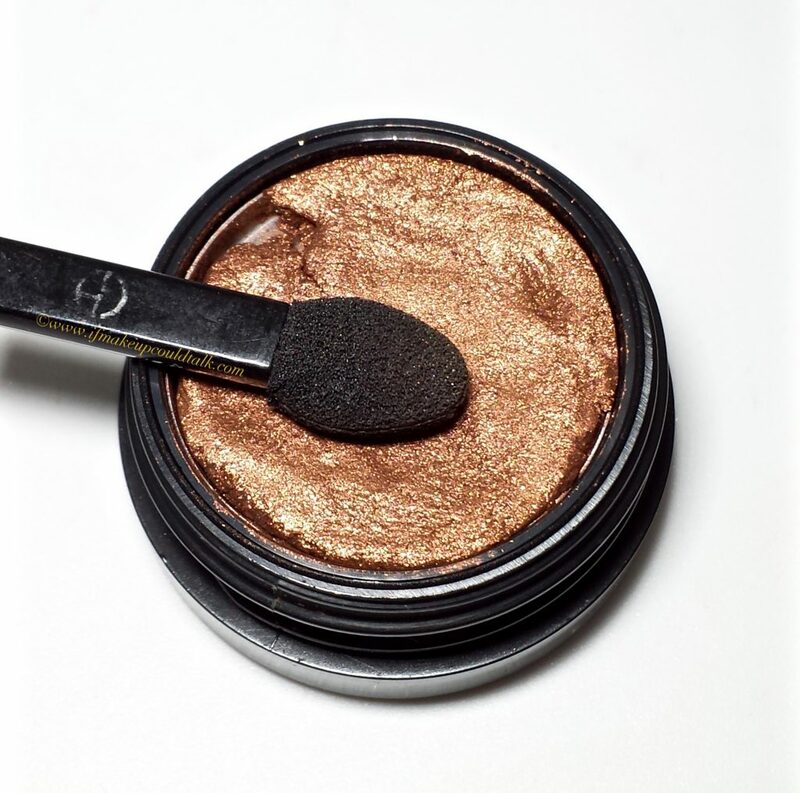 Dior Cosmopolite (reviewed here) is one of my favorite highlighters. This peachy golden color is deeper than OMG and packed more firmly into the pan. 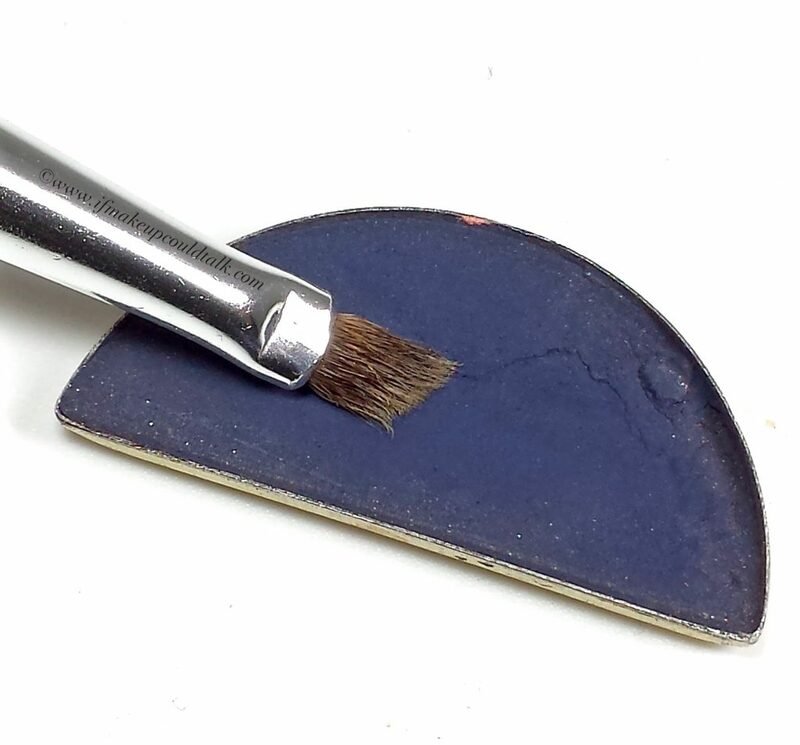 A denser brush and some pressure is certainly needed to get a good amount of pigment to stick to the brush hairs. 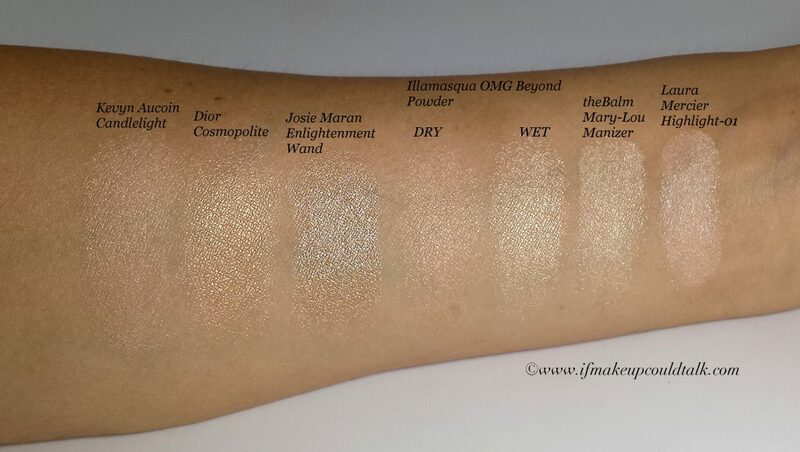 Josie Maran Enlightenment Stick (reviewed here) is a cream highlighter. This deep golden hue looks beautiful sheered out on many skins. The only issue is oiler skins may find the formula too emollient throughout the day. theBalm Mary-Lou Manizer certainly has more of a pale yellow tinge in its mix. 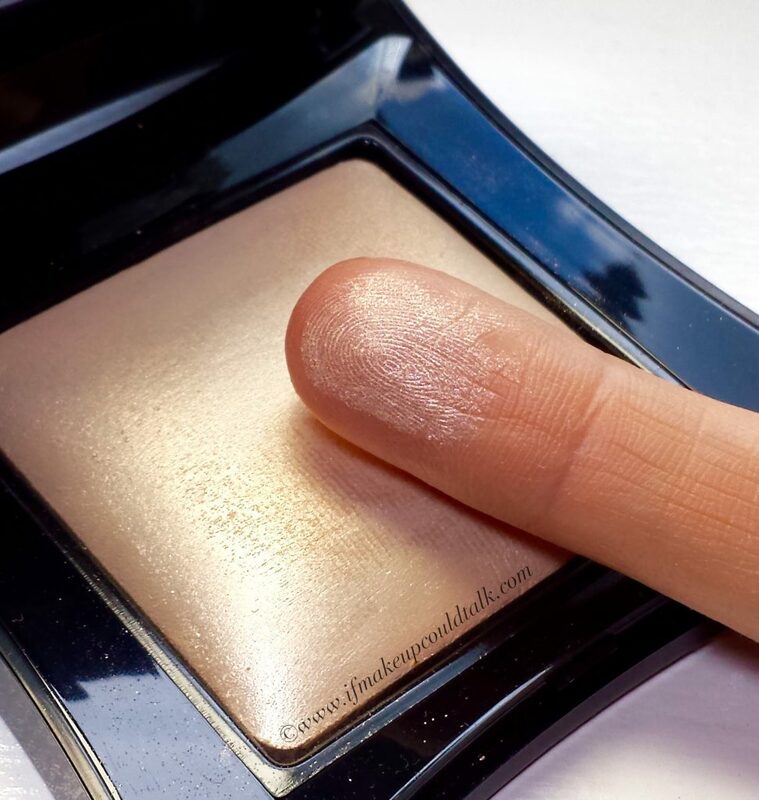 The bright golden sheen is evident with the lightest touch. Truthfully, I have not used this powder in years, simply because it is too much for my liking. Laura Mercier Highlight-01 is a baked powder that has a significant amount of pink in the formula. The highlighter is silky smooth and offers instant illumination, which is especially flattering on cool-tone pale complexions. 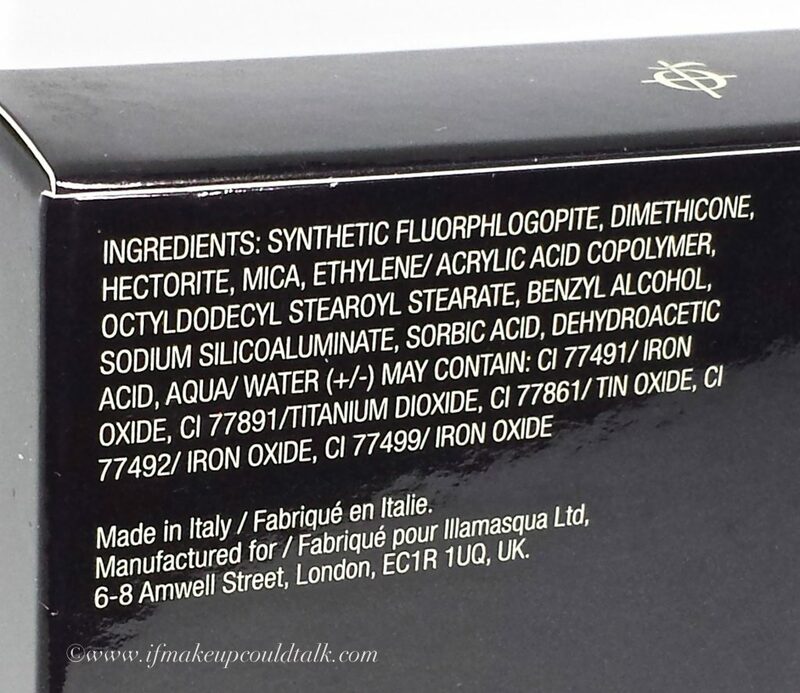 Illamasqua OMG Beyond Powder ingredient list. **Illamasqua OMG Beyond Powder is found at Illamasqua.com, lookfantasic.com, b-glowing.com, and selfridges.com. Makeup would tell you Illamasqua OMG Beyond Powder is beyond amazing in my book. The soft, silky texture, beautiful coloring, versatile finish, long-lasting results, and luxurious design and packaging was well worth the effort it took to acquire this beauty. As expected, this particular color is sold-out on most sites, but Illamasqua.com has since restocked their supplies. Can I find something similar here in the States? Perhaps, but where is the fun in that? Oh, the things I will do for makeup. 🙂 Until next time, be well, stay safe and be happy.